J.A. Baross and J.F. Holden, Overview of Hyperthermophiles and Their Heat-Shock Proteins. R.J. Maier, Respiratory Metabolism in Hyperthermophilic Organisms: Hydrogenases, Sulfur Reductases, and Electron Transport Factors That Function at Temperatures Exceeding 100oC. M.W.W. Adams and A. Kletzin, Oxidoreductase-Type Enzymes and Redox Proteins involved in Fermentative Metabolisms of Hyperthermophilic Archaea. R. Jaenicke, H. Schurig, N. Beaucamp, and R. Ostendorp, Structure and Stability of Hyperstable Proteins: Glycolytic Enzymes from Hyperthermophilic Bacterium Thermotoga maritima. M.W. Bauer, S.B. Halio, and R.M. 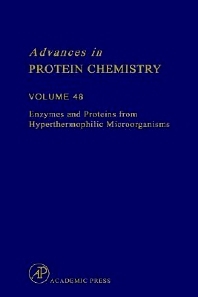 Kelly, Proteases and Glycosyl Hydrolases from Hyperthermophilic Microorganisms. J.DiRuggiero and F.T. Robb, Enzymes of Central Nitrogen Metabolism from Hyperthermophiles: Characterization, Thermostability, and Genetics. P.C. Michels, D. Hei, and D.S. Clark, Pressure Effects on Enzyme Activity and Stability at High Temperatures. F.B. Perler, S. Kumar, and H. Kong, Thermostable DNA Polymerases. R.A. Grayling, K. Sandman, and J.N. Reeve, DNA Stability and DNA Binding Proteins. Chapter References. Author Index. Subject Index. Biochemists, biophysicists, molecular biologists, microbiologists, and cell biologists. Massachusetts Institute of Technology, Whitehead Institute for Biomedical Research, Howard Hughes Medical Institute Research Laboratories, Cambridge, U.S.A.